Check out this nice write up on Jason Werner’s recent “StarField” show in the gallery, by John Boudreau for Take Magazine. Influenced by transcendentalists and Carl Sagan, Connecticut artist Jason Werner creates immersive paintings of the night sky. In his studio, Jason Werner is surrounded by stars. The walls contain his paintings of the night sky and deep space, subjects that have fascinated the artist for decades. 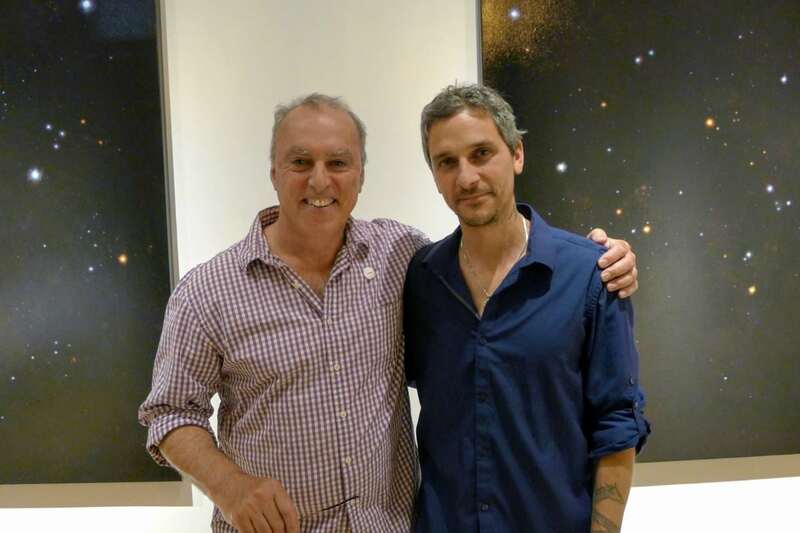 Several of his latest works, entitled Starfield 3-6, were recently displayed at EBK Gallery in Hartford. Werner has been drawing since a young age. From the beginning, he says, “the simple act of making black dots on white paper was fascinating to me.” Transfixed by deep field images from the Hubble Space telescope, he has worked to capture scenes at the furthest limit of human perception. Like the those images, his Starfield paintings at first seem deceptively simple: points of color on a dark background. Yet it is immediately apparent that these works aren’t meant to reproduce photographs. These large, mesmerizing canvases possess an incredible depth of field and a subtle variance in color. More than simple documents of far-off places, they are human creations that capture a sense of wonder. This quality was what attracted EBK Gallery owner Eric Ben-Kiki to the works. “There’s a pretty cool substance to them,” he says. “They’re very minimal, but very dense.” The paintings seemed to exert a gravitational pull in the gallery, frequently drawing viewers in off the street. Ben-Kiki, a pioneer in the Hartford gallery scene, amplified this effect by keeping the pieces lit until midnight each evening. Starfield 3-6 may or may not contain identifiable parts of the night sky—though viewers looking for Orion or the Big Dipper will come up short. “I want people to kind of not know where they are in the sky,” Werner says. He believes this disorientation emphasizes the images’ abstract nature, which helps viewers focus on the spaces in between the points of color. Although the subjects of the Starfield paintings are light years away, New England remains the center of Werner’s creative universe. He thrives on proximity to the natural environments that shaped writers like Emerson and Thoreau, and these places not only fuel his creativity, but also directly inform his landscapes. Unlike his long-standing fascination with the cosmos, it took Werner years to find his own path to painting landscapes. It was only when he began working on fully abstracted pieces alongside his landscapes that he felt a unique approach develop. 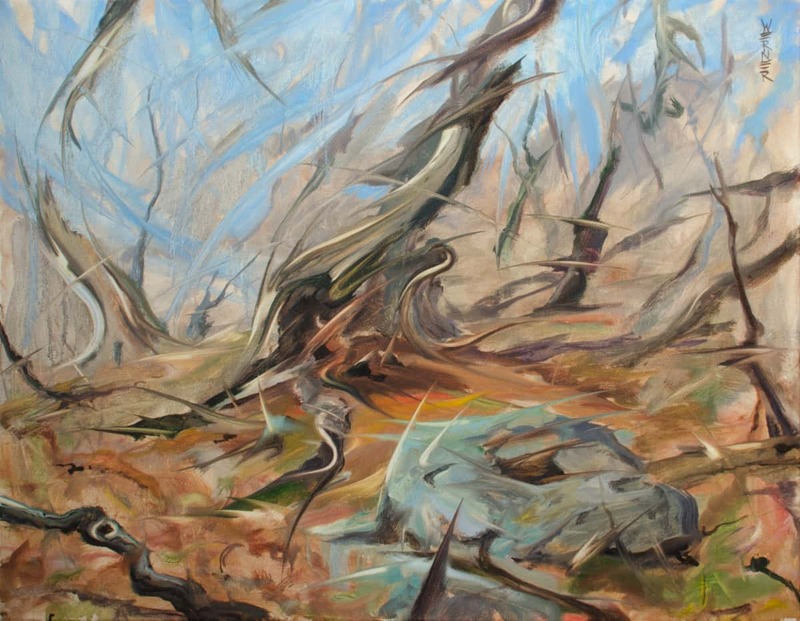 The two styles began to gradually merge until, according to Werner, “I felt it was me on the canvas.” Thick underbrush and choked trails are palpable in his landscapes, which feature slashing, angular strokes and muted palettes. The scenes are often unruly, which Werner says is part of his goal. “I like chaos,” he says. Werner plans to exhibit some landscapes in November at a show at Northwestern Community College in Winsted, Connecticut. It’s perhaps fitting that so much of Werner’s work deals with celestial and terrestrial themes, as his paintings provide an apt encapsulation of the artist himself—feet firmly planted in New England, but reaching for the stars.